Renderings courtesy of the City of Long Beach. Photos by Greg Santucci. Fenced off for well over a decade, the 3.7-acre expanse of land that sits just west of Park Avenue at 4th Street was once the right-of-way for the Pacific Electric Red Car trolleys that carried thousands of visitors across SoCal from 1901 until their demise in 1953. After months of work that began in August of last year, the City finally opened the green space as a full-on park in Belmont Heights. 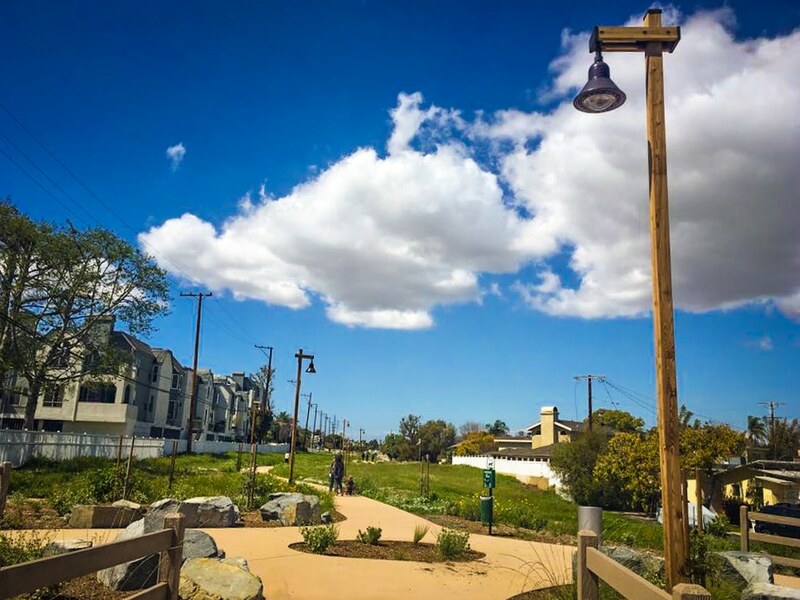 Dubbed the Red Car Greenway, its main feature is not only creating a “passive park” in the words of 3rd District Councilmember Suzie Price, but more importantly acting as a key cog in connecting the city’s bikeways: as the 6th Street bike lane begins construction, connecting Bellflower Blvd. all the way to Burbank Elementary at Junipero via 6th, a deviation from 6th will lead to the Red Car Greenway and Colorado Lagoon. Bicyclists can then connect to Marine Stadium and PCH should they wish. The 6th Street bike boulevard will also include a bike counter (like that on the beach path), curb extensions, bioswales, and other improvements. The total cost, $1.1M (as opposed to the original $903K costs) will be funded entirely through transportation and capital project grants. The greenway project features pathway lighting for those wishing to explore the park at night, trail boulders for seating, trash receptacles and doggie bag dispensers, wood grain textured concrete fencing at entries, and secondary decorative concrete pedestrian trails along the length of the greenbelt, connecting to local streets adjacent to the greenbelt. The Red Car Greenway was estimated to cost $1.05M and includes the contract award amount of $741,663, including contingency, and the cost for design, construction management, labor compliance and project oversight. The total Project cost is supported by $300,000 funding from the Los Angeles County Regional Parks and Open Space District Grant, $450,000 from the State of California Land and Water State Conservation Fund, $81,000 from the Los Angeles County Supervisor’s Office, $150,000 from Measure A (2016) , and $69,354 from Third Council District Fiscal Year (FY) 14 one-time funds. The funding is appropriated in the Capital Projects Fund (CP) in the Public Works Department.